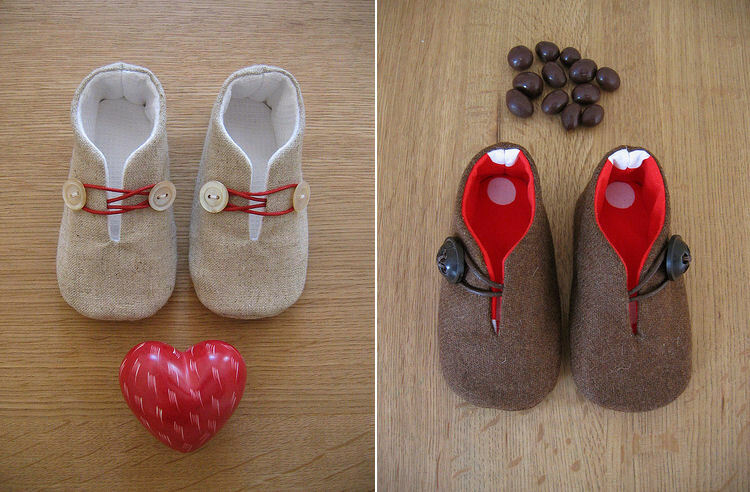 These precious images of petite bebe shoes, with both shoe and photo the creation of Catarina M, are absolutely darling. Her crispy-clean modern aesthetic appeals to me, as does the excellent composition. 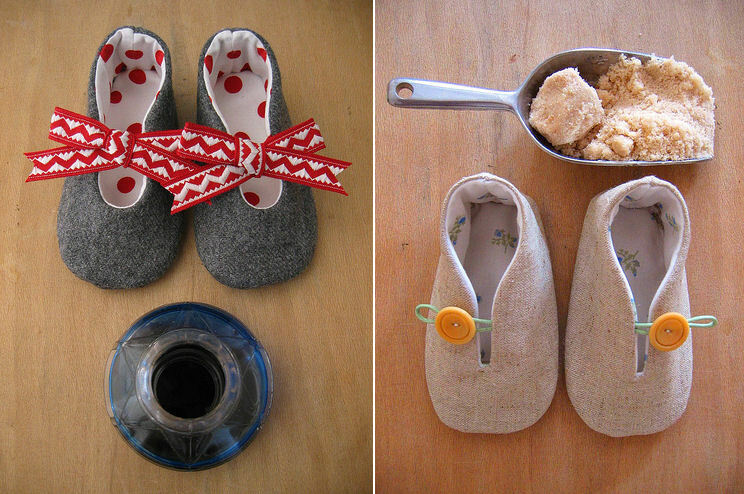 I adore the various elements introduced in each image relating to the design of the tiny shoes, especially the food (which I'd never think to put with baby shoes). The overall feeling is so fresh and innocent, almost as sweet as the baby I imagine wearing them, taking first steps with arms waving wildly, eyes fixed firmly on the floor. Catarina M is another great Flickr find today and I noticed that she has an Etsy store too, although it's not stocked so I'm thinking she introduces a new collection per season. Her bio tells us that she's both a mother and an architect who started sewing to create baby shoes for fun. Fun turned into passion (fooled around and fell in love, I assume? ), and after making several pairs she decided to open an Etsy shop. Although I'm not in the market for baby shoes, I do love her photography enough to suggest that she produces greeting cards and even wall art for expecting mothers - wouldn't it be charming to frame a few of her images for a modern nursery? Often, I find so many "Welcome Baby" greeting cards to be so tacky. I'd love to give a mother-to-be a pair of baby shoes with a card to match. It would also be nice to install a few framed 8 x 10 images in a nursery - I'm often so stumped when it comes to nursery design when I'm working with my clients. Having no children of my own, I'm not as clued into baby design as I should be. I've recently started scanning the market for baby art that falls outside of the traditional cartoon and animal motif. Images from Catarina M would work... Don't you think?